Our brewery starts its story in 1984 when Robert Morton Limited from Burton upon Trent, United Kingdom, were commissioned to design and supply a classic, showpiece brewery for Gold Reef City, Johannesburg, capable of accommodating complex stepped mashing, and capable of brewing all beer styles. The brewery was manufactured, shipped to South Africa, and established in Barney’s Tavern in 1985, where it stood on show as a working brewery for 9 years. Then, in 1993 the brewery was relocated to The World of Beer in Newtown, Johannesburg, as a working showpiece pub brewery. Due to liquor licensing issues, the brewery was ‘mothballed’ indefinitely in Garankuwa. The derelict brewery was then purchased by Brewhogs and completely refurbished in 2013, and re-established in Kyalami, where it stands today. With our current expansion, the 3000 liter brewery now has the capacity to produce in excess of 40 000 liters per month, and even further expansion plans on the table. Watch this space! The brewery, as supplied by Robert Morton Ltd from Burton on Trent, UK, in its original home in 1985 in Barney’s, Gold Reef City, Joburg, where it ran as a successful brewery for many years under the watchful eye of Bill Higgins, a development brewer for SAB. A special thank-you to Angela Frost of Briggs of Burton PLC, Burton on Trent, UK, for providing us with these photos. We believe there to be no other pics of the original brewery as all current pics were unfortunately destroyed in a recent fire at Gold Reef City. The brewery was trucked to Kyalami to an empty mini-factory where it underwent its transformation back to the beautiful showpiece brewery it once was. Our brewery under construction. Special thanks to Bruce Kirchmann & Fritz Schultz for putting in the extra effort in ensuring that the building was handed over to us timeously. Every part was stripped and either serviced, overhauled or replaced. It was important that this was done so that once we started to brew we would have no service related issues. 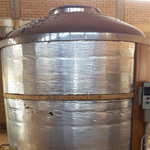 Sufficient oak cladding was salvaged from all of the tanks to re-clad the MDV & Lauter Tun (Brewhouse), and restore them to their original glory. Fermenters were clad in new timber planks. Everyone lent a hand! (we pay in beer…) Despite a few minor plant failures, we managed to get the brew into the fermentation tank. Can’t wait to taste it!! !